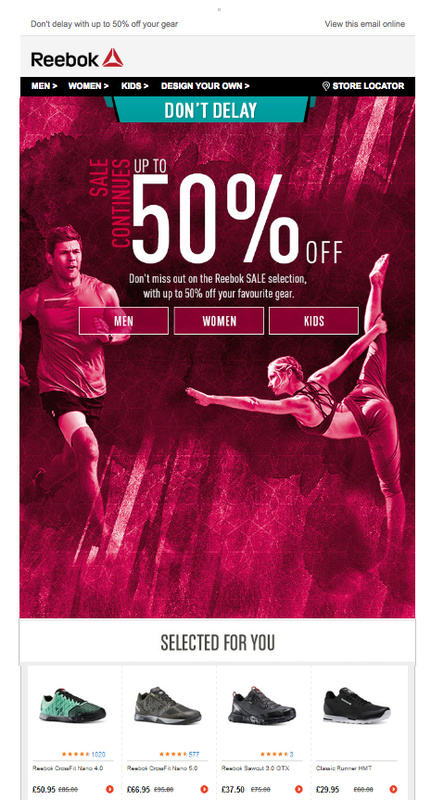 How are Top Sports Brands Personalising the Email Experience? Personalisation is a word that has been bandied around relentlessly in the marketing world over the last couple of years, and rightly so: offering customers a bespoke service has gone from being a luxury to an essential. With the Euro 2016 drawing to an exciting close (for England, at least), and the Rio Olympics gathering momentum, we decided to take a look at the newsletters and automated emails of some of today’s top sports brands. How are they shaping up? Warmed up and ready to go? Newsletters (or broadcast emails) are often the stalwart of any ecommerce email marketing strategy. Personalising the newsletter experience by slicing and dicing your customer base and sending different content to different segments can present a challenge; the more segments you create, the more creative you have to think about, the bigger the hassle. When you consider segmenting for things like gender, VIP customers, taste profiling (the list goes on), one newsletter can easily turn to five can turn into twenty versions. Which all sounds pretty stressful. Dynamic content (content blocks that change according to the recipient's customer profile), can be a good antidote to this; you can use the same template but personalise elements of it. So how did our sports brands fare at personalising the experience? Let’s kick things off with the (relatively) easy stuff. 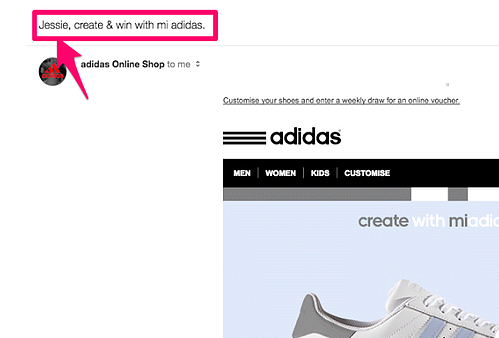 Adidas uses a recipient's first name in the subject lines of its emails. This is an easy way to make your emails stand out from the rest in the recipient's promotions tab, and potentially boost open-rates. Top tip: If you don’t know the first names of all your recipients, you need to make sure your email is coded so you don’t suffer a ‘Dear [firstname]’ fail (e.g. *|IF:FNAME|* Hello *|FNAME|*, *|ELSE:|* Hello, *|END:IF|*). After all, nobody likes to be reminded that they’re nothing but a cog in a mail merging machine. Likewise, many of the sports brands we looked at selling to both men and women opt for asking about gender during the signup process, and segment their newsletters accordingly in order to ensure that the contents are more relevant. This is nothing groundbreaking, but important if you want people to continually engage with your emails. After all, as we discovered in our Consumer Census 2016, 46% would consider not shopping again with a brand that kept sending messages with products they're not interested in. Dynamic content (sometimes known as adaptive content) is content that changes according to each customer's unique profile (for example, their browsing behaviour and interests). 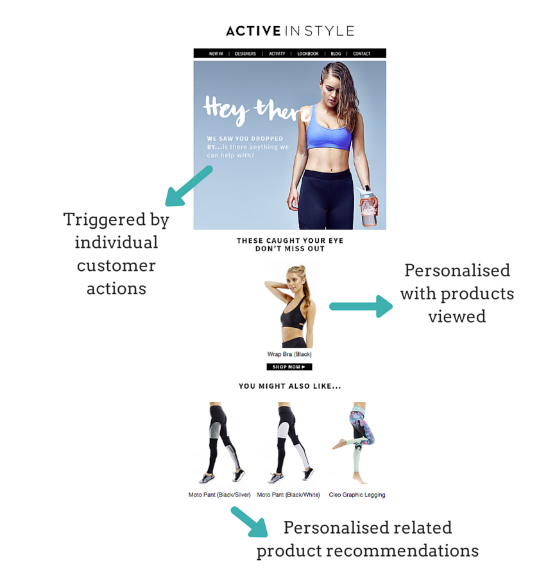 We were impressed by Reebok's use of dynamic product recommendations in its newsletter, creating even more of a personal punch. 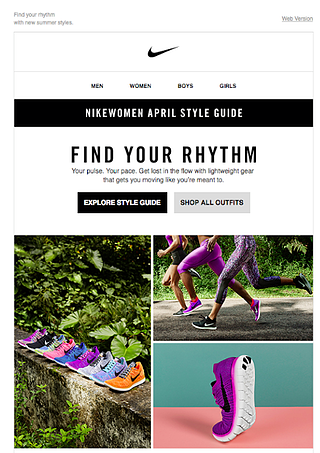 Many of the sports brands whose newsletters we’ve looked at are making an effort to make their newsletters more personal through basic segmentation and using subscribers’ first names. However, there were a few missed opportunities for brands to use more data to go beyond the basics. Dynamic content (elements of the same email that change depending on the customer that opens them) is a big opportunity. 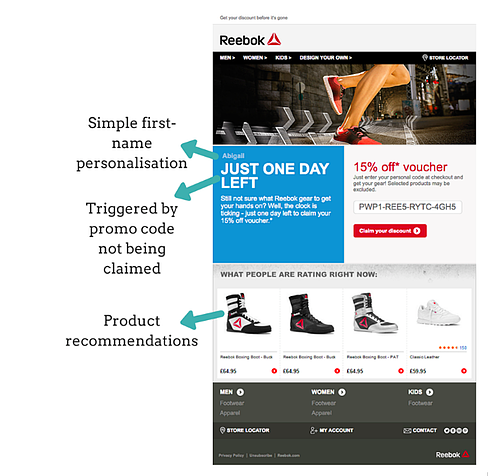 This is something we saw only in Reebok's newsletter, however is set to become more widely used as customers demand an increasingly personalised experience. The sending of emails in response to individual customer actions is in itself inherently more personalised than regular broadcast emails; it’s contextual, and delivers relevant, timely messages. Reebok’s welcome series centres around encouraging new subscribers to take them up on the offer of 15% off to make their new purchase. 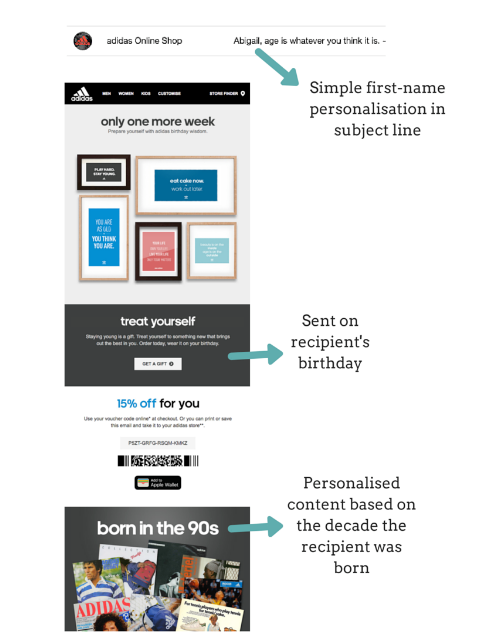 The series is responsive to recipients' actions - it sends up to three emails, based on whether the offer has been redeemed. If it has, the campaign ends. 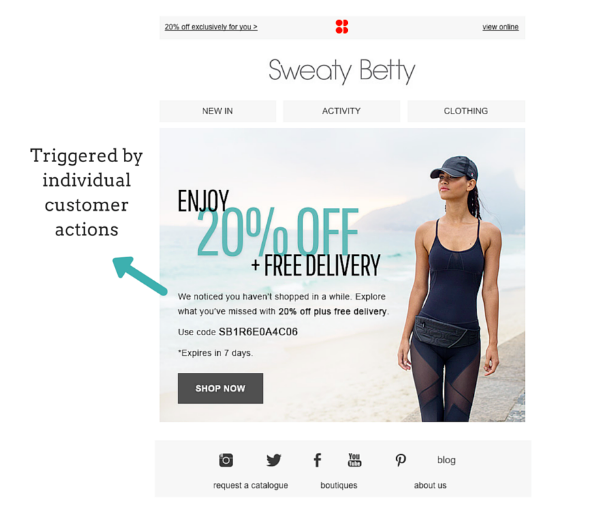 After a browsing sessions on its site fashionable activewear label Active in Style sends a lighthearted and personable browse abandonment email, promoting the products a customer has looked at and suggesting similar items. This is a good example of a triggered email that uses a customer's browsing habits to create unique, tailored content. If your customers - both old and new - haven’t shopped in a while, you might be at risk of losing them for good. Enter the lapsed customer win-back email. These automated messages serve to remind your clientele of your existence, and incentivise them to start shopping again. How do you create one? Read our cheatsheet on the topic! Below is a prime example of a lapsed customer win-back email, sent from Sweaty Betty. Noticing we hadn’t shopped in a while, we were offered a discount and free delivery. Tempting. How could it do better? The email doesn't contain any dynamic content that is tailored to the recipient's interactions or transactions with the store - something that may provide a more compelling reason to go back and shop again. There’s something incredibly personal about wishing somebody a happy birthday - it shows you know that person and care about them. 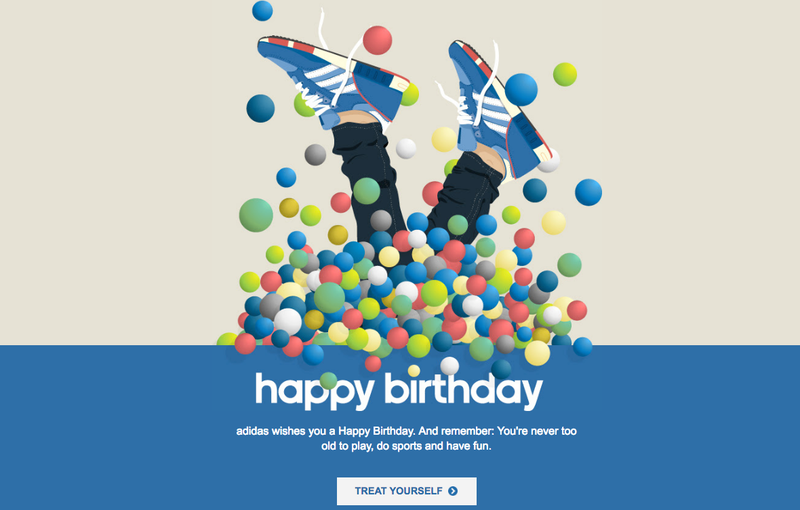 One brand that sent awesome birthday emails was adidas - the first email was sent in the lead up to the recipient’s birthday, the other on the day itself. Addressing the birthday girl by her first name, the emails adopt an excited, friendly tone and offer a discount; this creates the illusion that the email has been manually composed, instead of automated. As a result of new technology, the world of ecommerce is constantly in flux. Every week developers and data scientists are unveiling new ways for ecommerce marketers to understand their customer base and send relevant, bespoke emails. Our advice? Don't hold back. Embrace technology to take the plunge and push your personalisation to the next level. It doesn't matter if you're a stranger to data - that's what we're here for. If you're eager to learn more about the Ometria product and how we can help you use data to create personalised content in a quick and easy way, we're holding our annual Lifecycle Conference on 12th October. Tickets are selling fast, so click here to purchase yours and find out more.